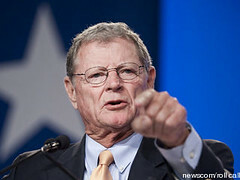 I wonder if U.S. Sen. Jim Inhofe is anywhere near burning Colorado today pitching his book about what he continues to call the “hoax” of global warming. The book, The Greatest Hoax: How the Global Warming Conspiracy Threatens Your Future, is really, in a sense, just a tribute to the oil and gas industry, but I bet none of that matters right now to the 32,000 people who had to evacuate their homes near Colorado Springs recently because of a raging wildfire probably caused by global warming. Hundreds of homes have been burnt to the ground. See, the issue is not the weather, despite the tragedies caused by severe catastrophic events most likely precipitated by global warming. It’s about over-regulation. And, of course, it has nothing to do with the fact that Inhofe has received $509,250 in campaign contributions from the oil and gas industry since 2007. Meanwhile, the wildfires have been fueled by “a super-heated spike on top of a decades-long warming trend,” according to one official with the National Climatic Data Center NCDC. This “super-heated spike” follows last summer’s record breaking heat in the nation. Oklahoma set the record for the hottest summer ever recorded last year, a fact of which we’ve been reminded in recent days by high temperatures reaching more than 100 degrees. At least there have been no wildfires here yet, but that could change. Recent high temperatures in the U.S. Northeast have also broken records. In fact, more than 1,000 high temperature records in the U.S. have been broken this last week, according to the NCDC. As I’ve long qualified, no one weather event can prove or disprove the dangers of global warming and the influence of man-made carbon emissions on the climate, but a steady pattern of catastrophic weather combined with a steady rise in the planet’s temperature should be more than enough to warrant more study and action. Perhaps, it’s too late to prevent more massive wildfires, drought and hurricanes in the near future, but at the very least can we now set Inhofe’s conspiratorial and extremist-religious ideas aside and rationally decide a course of action?